The members of The Mary Guentzel Quintet vary in age and musical background, but all have one thing in common: they are the best at what they do. Along with rehearsing together weekly, they pursue individual musical interests to refine their own sound.The Mary Guentzel Quintet consists of five members. The group was formed in 2004 after the disbandment of The Moonlighters dance band. Three of the members of Mary Guentzel Quintet came from The Moonlighters including Mary. The Mary Guentzel Quintet plays primarily the great jazz standards from the 30’s through the 50’s. Mary fronts the band and is the lead vocalist. She also accompanies Ron Affolter singing duets and harmonies. Myron Wolf adds tenor sax and clarinet , Bernie McGuire plays the piano, Ron Affolter plays the upright string bass and various percussionists provide the rhythm on the drums. Mary is a talented and accomplished jazz singer who loves to involve her audience during her shows. She sings in an upbeat, pleasing style. Mary also plays the tenor sax and has played with The Moonlighters dance band and Echos Big Band. Mary sang extensively throughout her high school and college years. In recent years she has sung with Mankato Opry country christmas show, The Gold Star Band, Amy Manette band, Les Fields Orchestra, Sonny Bryant of The Platters, Billy Steiner of City Mouse, Cedar Paddle folk band, Blue Ox Jazz Babies, Jim McGuire Jazz Trio, Kris Keltgen and the Riverbend Dutchmen and others. Mary also keeps busy singing for area weddings, funerals and other functions. Mary’s band members say one of her greatest attributes, along with her obvious vocal talent, is her pleasant personality. Mary has a sincere appreciation of the musicians in her band and she is well liked and respected by them for that. Mary loves to interact and visit with her audience before, during and after performances. She is a true entertainer in every sense of the word! Bernie is self taught on the piano and has been playing since age 9. He plays mostly by ear but also by note. Bernie can instantly change the key in any song he is playing to suit the singers voice. 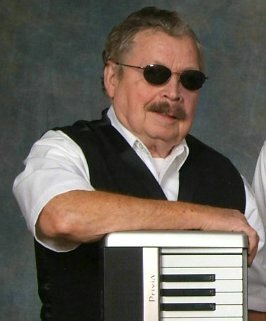 He is also an accomplished piano accordion player. Bernie has played with Banjo player Glen Purdy, Lefty Alexander’s band, Cliff Hermel Band, Big Lou Kaveny’s band, Frank Yankovic Band, Govenaires Drum and Bugle Corps, Saint Mary’s Polka Mass Band, The Moonlighters dance band and Echos Big Band and is active in area organizations where he volunteers his talents on the piano for many worthy functions. Bernie’s vast repertoire of memorized songs never ceases to amaze the rest of the band. Myron has an extensive musical history. He has played with close to 50 bands in his music career which started when he was in college. His passion was and is for Old Time music but his talent with his instruments allows him to play in any style. He really enjoys playing the jazz standards on Mary’s play list. These songs allow him the freedom to improvise around the music that is written on the chart and he does it with ease. His band members kid him that he doesn’t even need the chart! Myron has performed with The Jolly Brewers, Clem Brau and the Jolly Lumberjacks, Ivan Kahle, Roger Kodet and the Cards, Six Fat Dutchmen, Chuck Thiel and the Jolly Ramblers, Kirk's Dance Band, Echos Big Band, The Moonlighters dance band and a host of others. Myron is a perfectionist on his instruments but has a fun loving attitude and loves to josh with the other band members. The band members have said they consider it an honor and a privilege to work with such an accomplished musician. Myron has also just rcently been inducted into the music hall of fame in New Ulm. We are so proud and honored to have him as a member of our group. In his music career Ron has performed with folk groups Oak Grove String Band and Long Journey Home, Donna Douglas from the Beverly Hillbillies and also with the queen of country, Jean Shepard. For years Ron was a member of the band East Side Pharaohs. He also plays bass with Cedar Paddle folk band and The Flathead Cats folk band. Ron has his own show, a solo cowboy act called "Lonesome Ron". He dresses in western attire, plays the six string guitar and sings songs by Roy Rogers, Gene Autry and other famous cowboy singers of years gone by. Ron has a vast knowledge of local and western lore and weaves these tales into his musical performances. Marv has been playing drums since he was in 5th grade elementary band and played in concert and marching bands throughout his school years. Marv studied under well known local drummer Jerry Udelhofen. After graduating Marv played for a short time with a local rock band but then took time off to raise his family. After picking up his sticks again he has played with The Moonlighters dance band, Echos Big Band, Cedar Paddle folk band, Chance Band, Sonny Bryant and Doc Merlot, The Platters, Jim Lawrence Orchestra and The Amy Manette Trio. He still plays with several of these groups. Marv is proficient in many styles on the drum set and also plays Latin style hand drums.